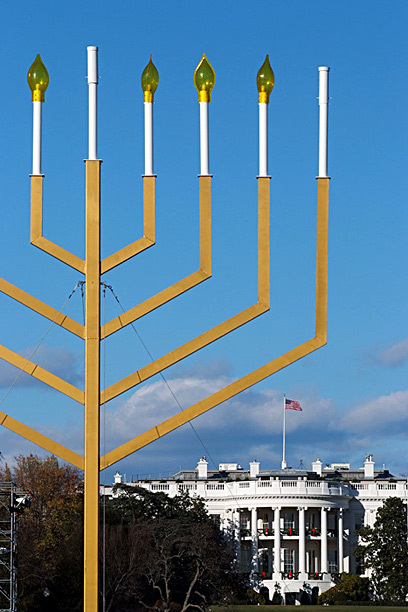 WASHINGTON - The larger-than-life Hanukkiya towers over gathered onlookers on the Ellipse—a manicured field located near the White House. Crowds fill the carefully-groomed lawn bundled up with heavy jackets in an attempt to insulate themselves from the teeth-chattering cold. Rabbi Abraham Shemtov wields the microphone and, among much fanfare, calls US Attorney General Michael Mukasey to the podium. Together the pair mounts the crane located nearby and the crowd closely watches as they place a torch up against the large wick to light an oversized Hanukkah candle. The crowd erupts into applause that continue on long after Shemtov and Mukasey put their feet back onto the ground. As Mukasey gets off the crane, he delivers a short and concise holiday message: "It's not easy to fight for freedom, the struggle of Hanukkah continues to this day. Today we have Iraq and Afghanistan, just like in the past (there were similar struggles for freedom)." The Attorney General, who happens to be an observant Jew, takes a moment to reflect on the origins of the perennial holiday and how the lessons from the Hanukkah story can be applied to contemporary events. "Something very special is going on here," an elderly Jewish man says with a twinkle in his eye. "We are lighting the Hanukkiyah, one of many Jewish symbols, in one of the most symbolic places in all of America. Is there something a Jew can take more pride in than that?" he asks. Rabbi Abraham Simantov was sent to Washington, DC by the Chabad-Lubavitch organization in 1974. Since then, he says "we have become the Jewish address for every matter and issue." In the last 15 years, his family including his son Rabbi Levi Shemtov, has come to join him in Washington. The younger Shemtov, deemed the "Rabbi of Capital Hill" by the Washington Post, has managed to get a lot accomplished in the US capital. 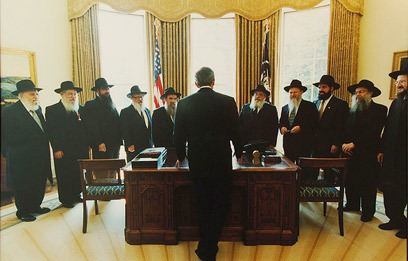 During his tenure, he has helped strengthen the Chabad organization's ties to US policymakers. Not long ago, President Bush signed a document dedicating a day of Jewish education in United States in honor of the rabbi. Rabbi Shemtov, who regularly leads educational sessions in the capital to many members of Congress, has succeeded in gathering a robust network of Senators that work to advance Jewish causes. 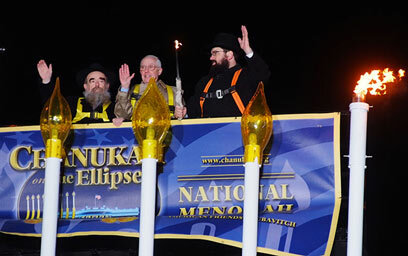 See all talkbacks "Lighting the Menorah at the White House"